You’ll be surprised by what’s not happening on your sales calls. 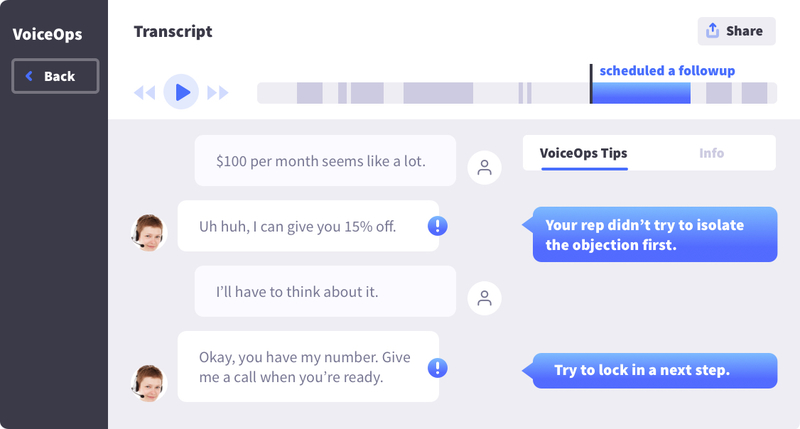 VoiceOps uncovers critical coaching opportunities in your calls. Optimized for high-volume sales teams. $100 per month seems like a lot. Uh huh, I can give you 15% off.. Your rep didn’t try to isolate the objection first. We bring managers right to the most critical issues across thousands of calls, so that they can spend most of their time on their highest-leverage activity — coaching. We bring you to the specific point in a call where there’s an issue, so that you can coach by way of example in your 1-1s and daily floor interactions. Annotate and share with your rep.
Use our dashboard to make sure your team’s behaviors are trending upward. Keep tabs on whether anyone is slipping away from good sales behaviors. After transcribing your calls, we use a combination of machine-learning and QA to get human-level insight into every call, accurately and at scale. I was frankly amazed at how quickly the analysis came back, but I was even more amazed at how spot-on the initial set of analysis was. Connect with any call recording system, including custom and on-prem. We do all the work, not your IT team. Large enterprises trust VoiceOps with their data. We’re GDPR and PCI compliant. Dedicated account manager and 24/7 technical support.